Penultimate SWF/UWRF post. Today we’re talking about writing from the diaspora, the future of translation, and objects of piety and consumerism. Today’s adventures in Southeast Asian writers festivals feature two panels from UWRF, one from SWF, and a broad look at the idea of the construction of space and borders in cities and minds. Steph attended two panels on Spec Fic at SWF this last week. There were also two panels on horror, but she was unable to attend those. Under the cut: reading lists, Western-centric publishing, hantu on building sites. A travelogue is an old tradition; an old form of writing. There are records of travel diaries as early as the second century CE; there are Arabic travel journals in the twelfth century and Chinese travel literature in the tenth. There are diaries and journals; maps and economics; boredom and poetry. A travelogue is the transcription of an adventure; of an exploration; a movement into the unknown or, less commonly, into the known. Travel literature considers one’s identity, and one’s country, and one’s world. A travelogue is, often, a reflection of the self. A travelogue tells the audience a lot about a traveller. Between the lines are the things the traveller sees every day, and the assumptions a traveller makes, and the joys a traveller takes from moving through the world. In Australia, and predominantly in English-language writing, a travelogue is about the traveller; and in its way, it is about the other. This requires an assumption around who is the audience, and who is the other, for there are few other ways to represent those with whom the narrative comes in contact. I love travelogues. I love them for what they tell you about a person, and a place, and sometimes, what they tell you about yourself. I love travelogues of Australians in Australia; non-Australians in Australia; Australians not in Australia. (I also love travel tales of people in China and Malaysia and Singapore, the other places of my heart) I love these because whether these are travel stories of people in their homes or not in their homes, their stories are always new to me, and there’s always an exploration and an unfamiliarity and a joy, of sorts. I love it when people talk about their travelogues! What drives people to leave the comfort of their everyday lives and suffer in far-flung parts of the world with unpronounceable names and indigestible food? Is it our essentially “nomadic” nature, as Bruce Chatwin claims? Is it “The Call of the Wild”? Or is that just a bunch of pretentious First World rubbish? All of the above, according to Tom Doig, author of Moron to Moron: two men, two bikes, one Mongolian misadventure. Come along and find out why. The audience: clearly not me. Though I choose to leave the comfort of my inner-north Melbourne home, it’s for the comfort of the family home in Malaysia, with its squat toilets and five grown adults in two bedrooms and mosquito netting. 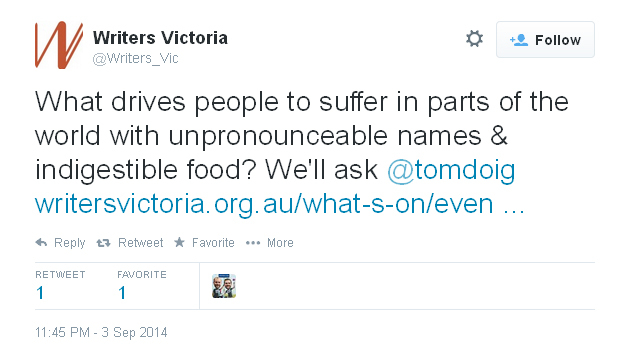 I’m a person with a name that is, in its way, unpronounceable (certainly many people mispronounce it). My food is, to many people, indigestible. So, in the dichotomy of the audience and the other, I’m pretty comfortable in assuming I’m the other, here, despite having been born in Australia and loving a good travelogue. People not from the “first world” travel, and then write about it. People from the first world can be pretty rubbishly pretentious. “The Call of the Wild” is primarily a racist concept used in racist situations (white people talking about not-white people). I really wanted to go, because I love travel writing and I’m currently working on a brown person’s travelogue (mine). Now, I really want to go and find out if this event is gonna be as casually, thoughtlessly racist as it sounds like it’s going to be, but I really can’t justify the $50 just to get angry. If you go, let me know. I’ve got some questions. 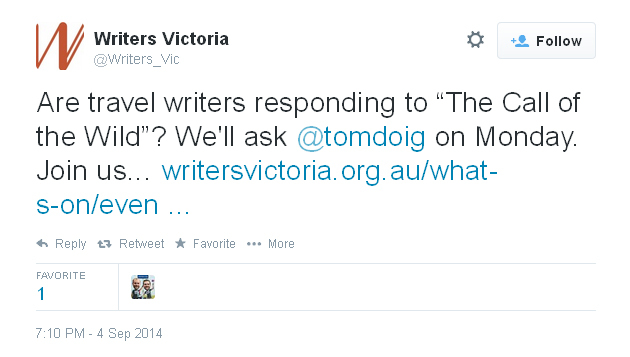 I have not made my sadness known to Writer’s Victoria, as I’m not currently a member. Lately, as I publish more and more regularly, and as I truly begin to consider myself the writer part of ’emerging writer’, it’s something I’ve been considering. But right now, after this, I don’t want to. How can I expect support from an organisation that promotes this exclusion? We’re just getting on with our lives. And mocking. So much mocking. And that would have been the end of it, except that, still chuckling at my own joke, I went and had a shower. You know what happens in showers, right? IDEAS. Unless you’re deliberately showering in the hopes of brain stimulation. Then your brain just laughs at you, and you sadly realise you’re doing nothing but wasting water. I got thinking about what an Australian YA dystopia — well, really any Australian dystopia — would look like, and how it would work. Not that I’m treading new ground — remember my rant about The Sea and Summer? — but it’s not like America lets the existence of a couple of iconic dystopias stand in the way of publishing and filming more. Apropos my last post, because this is something I think about a lot, especially since I saw Catching Fire last week, and am now re-reading The Hunger Games. And, dammit, I get sad that we don’t have a YA dystopia with an emotionally stunted iconic heroine played by Shari Sebbens and brooding and handsome hero played by Jordan Rodrigues of our own! So the thing about Australia is, we’re roughly the same size as the United States, but much more sparsely populated. So in the event of some kind of technological cataclysm, such as a nuclear electromagnetic pulse coupled with radical climate change, we’re less likely to wind up with a totalitarian one-party state than a series of isolated communities that occasionally fight over resources. Some of those isolated communities might be totalitarian one-party states, though, if you’re into that sort of thing. For example, Perth is separated from the rest of Australia by a GIANT DESERT, and Western Australia is a vast state in its own right, so that would be the first to separate. (Nightsiders by Sue Isle is a collection of novellas set in a dystopian Perth.) I’ve never actually been to WA, but it was the last state to join up when we were federating. (At one stage, “Australia” was going to be the eastern and central states, plus New Zealand. Ah, good times.) WA also has, to a considerable extent, its own isolated legal system, not to mention a lively secessionist movement. How well it would do on its own is debateable, but if we assume a system where the Federal Government and Constitution no longer function, I reckon WA would be the first state to go full independence/Mad Max style leather-clad anarchy. Tasmania would go next, because it’s an island, and I shall refrain from making cannibal jokes out of consideration for … you know. We would also shed Darwin, which is closer to South East Asia than it is to other Australian cities. Likewise, far north Queensland would probably be cementing its close geographic ties to the Torres Strait and New Guinea — in the coastal regions, at least. Further inland, you’d probably have your isolated homesteaders, the kind of people who already think they’re living in the End Times and prove it by voting for Bob Katter. Queensland, as people like to point out whenever the issue of daylight savings is raised, is basically several states smushed together anyway. I expect my mum will end up in Clive Palmer’s People’s Republic. …Come to think of it, there’s a lot of mineral wealth in WA and QLD, not to mention uranium in the Northern Territory, but how much of that is of use to those states if large-scale international trade has collapsed remains to be seen. But it certainly brings them closer to self-sufficiency than, say, Canberra. ANYWAY, what you end up with are several separate communities, not hugely trusting of one another. (Even now, you can see the old rivalries in the scrum that develops around GST revenue and Federal funding.) Stack on a few generations, let this develop as the status quo, let technology re-develop but keep in mind the effects of climate change, and what do you have? A totalitarian state? A laissez faire corporatocracy? Anarchy? All this and everything in between, depending on where you are? Not to mention all the nations around us would dealing with their own problems, many of them small island states being swallowed up by the rising oceans. ”SCARY FORNERS INVADING HONEST, WHITE AUSTRALIA” is one of those right-wing tropes I prefer to avoid, but there comes a point where you’re wondering why they’re not knocking on the door. Again, this comes back to those odd US dystopias where the rest of the world apparently doesn’t exist. Certainly in The Hunger Games, Panem includes Canada, but what’s meant to have happened to the rest of North America is a mystery. But that’s set so far in the future that no one — well, not Katniss, whose education has mostly involved coal and revolution — has any particular understanding or memory of the United States as a thing that existed. Australia doesn’t get to be an isolated dystopia, because, much as some politicians would like to think otherwise, we’re not an isolated nation. The lines might wind up drawn differently, but we don’t get to stand alone. The Interrogation of Ashala Wolf by Ambelin Kwaymullina is the first in a YA trilogy (I think) about young people with special abilities in a future, dystopian Australia. It’s also one of the few works of science fiction by an Indigenous author — oh, look, she’s a guest of honour at Continuum next year, plug, plug, plug. I actually didn’t finish the first book, because it wasn’t what I was in the mood for at the time, but I couldn’t actually say whether it’s good or bad or in between. Karen Healey’s When We Wake isn’t precisely a dystopia — its future Australia is pretty great, provided you don’t care about refugees, or incredibly powerful militaries, and what not. In short, it’s very much like the present day — quite fantastic, as long as you don’t look at things too closely. An anti-rec: The Rosie Black Chronicles by Lara Morgan. I can’t remember if this is actually dystopian, or just plain old sci-fi. I was too busy facepalming at the terrible writing and general racism to pay attention. This is mostly a book review rather than a 101 on writing someone else’s face, so we’re going book review first, issues town second. My Island Homicide is the first novel by Catherine Titasey, not quite a crime novel set on Thursday Island in the Torres Strait, though I received it under the guise of being a crime novel. I would not describe it as a crime novel, though the crime is there and looms large: it’s more a slice of life, and it’s kind of fun. There are not that many fiction books about the Torres Strait, and there are even fewer books that end happily (as it were); that have an Islander protagonist; that are this great slice of Torres Strait Life that I wanted to just keep on keeping on. I loved the minutiae in the book. I loved the Sissys getting more and more animals as Jack palmed them off. I loved everyone’s casual acceptance of maydh (a curse), and the mostly natural weaving in of the local Broken English, and I loved loved loved the protag’s mum coming home to Thursday Island and finding herself again. And I wanted to love it as a book. But it reads weird. It was billed as a mystery (and it is), but it’s also a romance and it’s also a slice of life. On pg 138, almost halfway through the book, there’s suddenly a family mystery! At times it seems as if the pedestrian plodding of the story – not of the plot, but the pace of the book itself – is a reflection of life on Thursday Island, just going with the flow and letting it happen, but at other times it simply felt like uninspired pedestrian writing. I wish that the book had been able to settle into what it wanted to be, rather than hopping back and forth. My Island Homicide talks about all sorts of issues, but only briefly. It mentions in passing the predominant local crimes (assault and theft) and their causes (alcohol, hunger). It makes a major plot point of the lack of education in the Torres Strait, and how easy it is to pretend like the white man is doing something when really he isn’t. It laughs away DV and assault, and it’s hard to tell when it’s poking fun with versus when it’s poking fun at the things that happen in island life. These are major issues in the Torres Strait and also incredibly damaging stereotypes when seen through non-TSI eyes, and I wish more had been done to flag this as not okay. There’s a lot of unquestioned behaviour and acts which seem less than ideal. A white person describes the abuse they’re suffering from a black person as ‘racist,’ with no looking at the fact that it’s not possible (due to the equation of privilege + power = racism). There was some super dodgy stuff going on around the young gentleman who was unable to talk (sometimes it was implied he had suffered brain damage, sometimes just that he couldn’t speak and refused to sign) in terms of attitudes. The book keeps making jokes at the expense of Gen Y, followed by some vegan hate, which didn’t endear it to me. (At one point a member of Gen Y declares they don’t know what Twister the board game is, which, I call nope). This is obviously less critical than the class and social issues in the Torres Strait, but also totally not cool! Thea’s mother thinks Thea’s under maydh, and though Thea is unsure she goes with it, being treated for the curse and in the end she recovers with two answers: a western medicine answer, and a maydh answer. I love this resolution. Of course there’s a western medicine answer, because western medicine is always trying to quantify non-western traditional methods and outcomes. But there’s a ‘traditional’ outcome and solution too, and we’re never told which one is right in the context of the text. It just is. It was really nice to read a book set in the Thursday Islands, and to be reading a book that was trying so hard to do justice to the Torres Strait and to this part of Australia’s population and culture. But it wasn’t a great book, and I can’t whole-heartedly recommend it to you. It was fun and easy to read, but it took me about 100 pages before I was actually into it. If I was handed another book by this author I would consider reading it, and I would certainly support what she’s doing (writing about Torres Strait Islander communities) but I wouldn’t leap to read it. Three out of five jiaozi. If you want to read the book, let me know, there’s a possibility this copy is mine. Milk chocolate. Almond. Burnt honey. Olive. Dark olive. Peanut brown. Nut brown. Hey you know what we are not? We are not a menu. We are not food items or items for export or exploitation or fetishisation, even after you give birth to us, much like many of these items were (or still are). Coffee and cocoa in particular, with their slave labour connotations and the indigenous exploitation inherent within, makes these comparisons, even when unintentional, totally on the dodgy side. It is not a compliment to describe brown characters in food terms. This blog post is not a cultural appropriation primer or anything like that, because I don’t have the time nor the patience, and also because many other people have done that work, though maybe not from an Australian point of view. So maybe that’ll come another day. My Island Homicide is very firmly a book set in the Torres Strait. It is on Thursday Island and Horn Island and a couple of tiny dotted islands in between. Titasey is white; though she is married to a Torres Strait Islander with TSI children, and has lived on Thursday Island for 20 years. The POV character is a half-Islander, half-Caucasian woman whose family moved away from the Torres Strait and now she’s come back, wanting to live her stereotypical idyllic island lifestyle and maybe along the way she’ll learn some things. This worked for the most part as a frame for explaining things about the culture to an assumed non-Torres Strait audience. Thea learning Broken English was woven with shame (at not knowing it) and embarrassment and also naturally into the text, in a way that didn’t throw me out and that was awesome. Things were explained where explanations worked, but the text didn’t assume the reader was completely lacking in knowledge (except, inexplicably, when it explains that Billabong is a surf company). You can tell, when you’re reading My Island Homicide, that Titasey is an outsider but has worked to not be an outsider. She presents this culture that isn’t hers as respectfully as she can, and though I wish it’d been better written I really appreciated that.